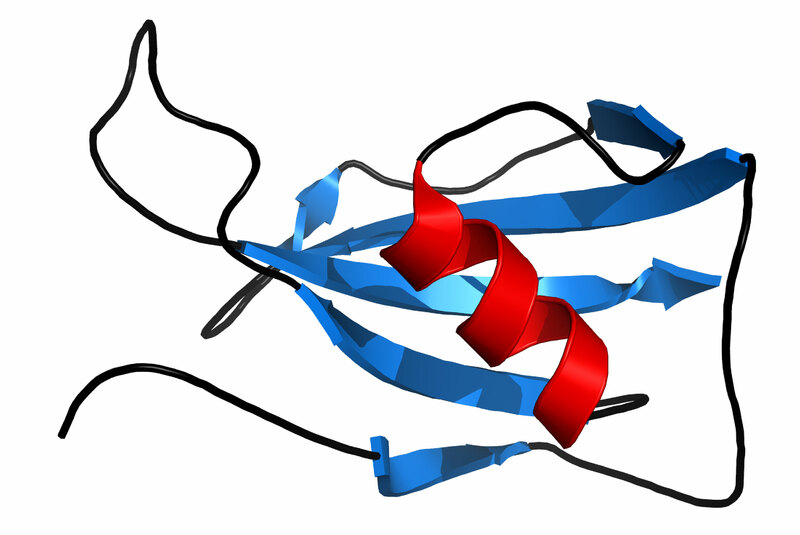 The structure of a protein named thioredoxin. 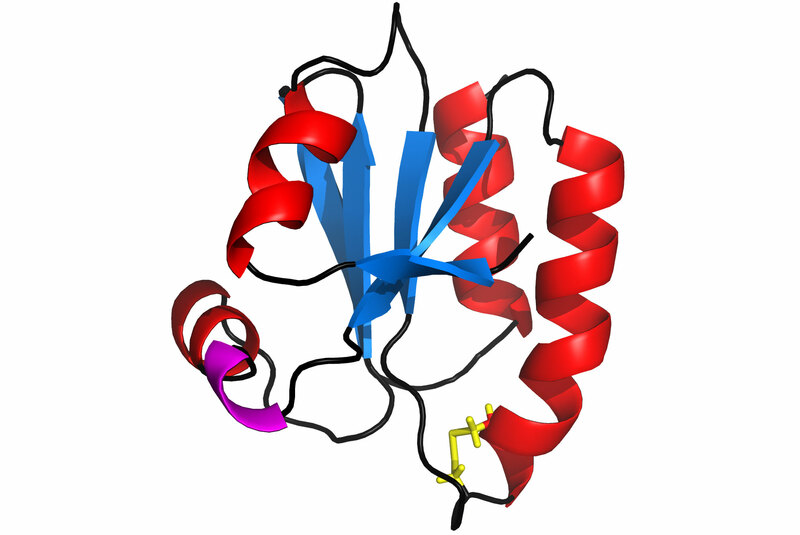 Garry Buchko and colleagues used NMR to solve the structure of the protein, which is found in an infection often conveyed by ticks. 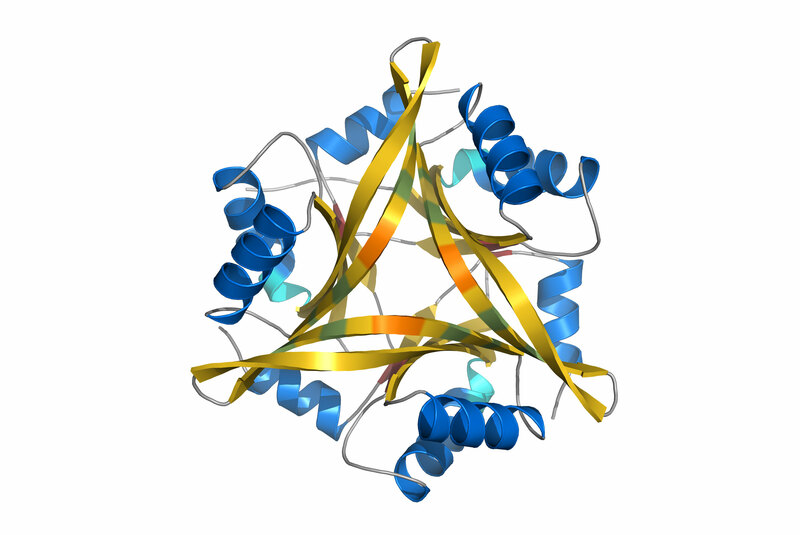 A protein in the pathogen that causes cryptosporidiosis. The microbe can cause mild to severe diarrhea in people who accidentally swallow a mouthful of contaminated water. Biochemist Garry Buchko is part of a team that has solved 1,000 protein structures related to infectious disease. 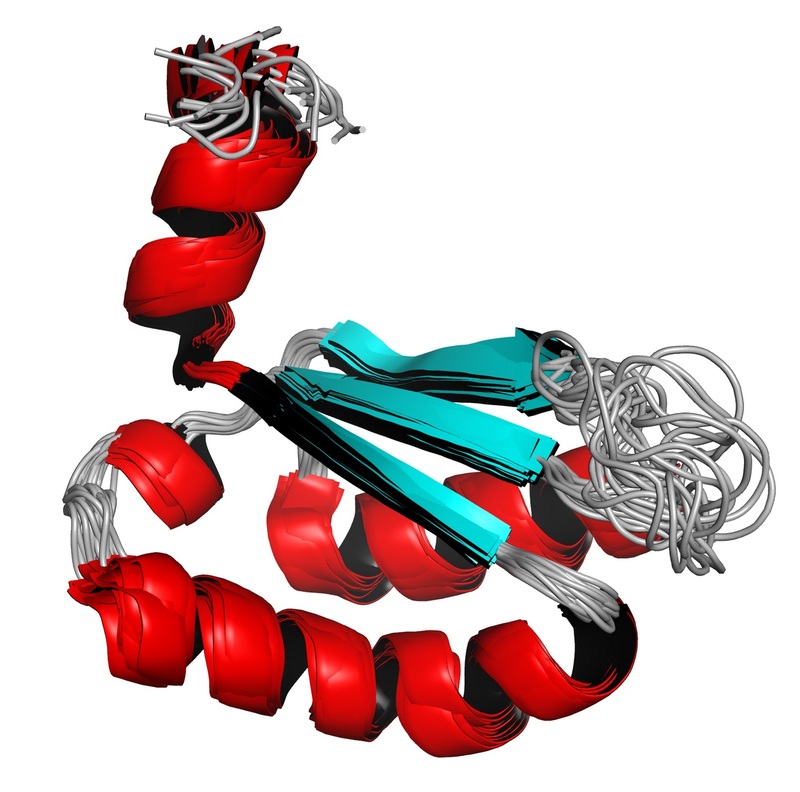 Buchko and colleagues solved this structure of a protein found in the organism that causes malaria. A protein in the microbe that causes melioidosis, which occurs most often in people who live in tropical climates. Infection often starts in the lungs when contaminated dust or soil is inhaled. A protein in the micro-organism that causes giardiasis, which translates to nausea, abdominal pain, fatigue and other symptoms in hundreds of millions of people worldwide each year. RICHLAND, Wash. — Garry Buchko and his colleagues are at the front line battling some of the most fearsome enemies that humanity has ever known: Tuberculosis. Pneumonia. Ebola. Plague. Botulism. But he is not in a hospital or field tent, taking vital signs or administering medications. Instead, Buchko the biochemist is in the laboratory, where the front line is the world of proteins — the molecular workhorses that keep all organisms functioning properly and make life possible. Using some of the highest-tech approaches available, he works with scientists in the Pacific Northwest to uncover crucial information needed to develop better treatments or vaccines against a host of nasty agents that can cause body aches, nausea, fatigue, food poisoning, diarrhea, ulcers, difficulty breathing, and death. Buchko does such work as part of the Seattle Structural Genomics Center for Infectious Disease, one of two centers funded by the National Institute of Allergy and Infectious Diseases tasked with solving the structure of proteins that enable pathogens to live, thrive, and infect people. 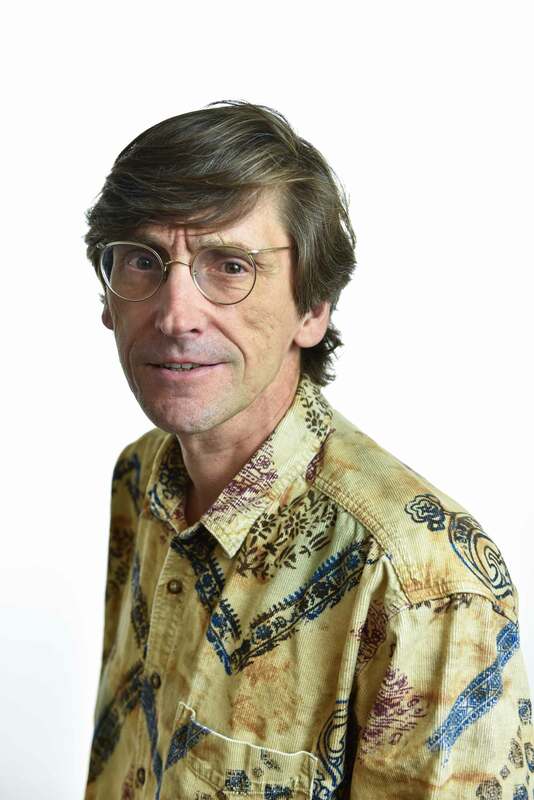 Scientists from four institutions partner in the effort: The Center for Infectious Disease Research, Beryllium Discovery Corp., the University of Washington, and the Department of Energy's Pacific Northwest National Laboratory, where Buchko does his research. It is challenging work. Protein shapes are very complex — many look a lot like convoluted roller coasters with multiple twists, turns, and loops, all squeezed into a tiny space just one ten-thousandth the width of a human hair. The arrangement and lengths of these features give each protein its specific biochemical properties — what other molecules they will interact with and precisely what they will do in the body. Knowing the precise shape of proteins provides a blueprint for scientists searching for new ways to disable the pathogens and stop the diseases they can cause. Buchko's expertise is with nuclear magnetic resonance or NMR, which is very similar to the magnetic resonance imaging technique widely used by physicians to diagnose all manner of medical conditions. Buchko scrutinizes proteins from pathogens drawing upon the NMR technology at EMSL, the Environmental Molecular Sciences Laboratory, a DOE Office of Science user facility at PNNL. While the end result is an atomic-level picture, it's not as simple as snapping a photograph. 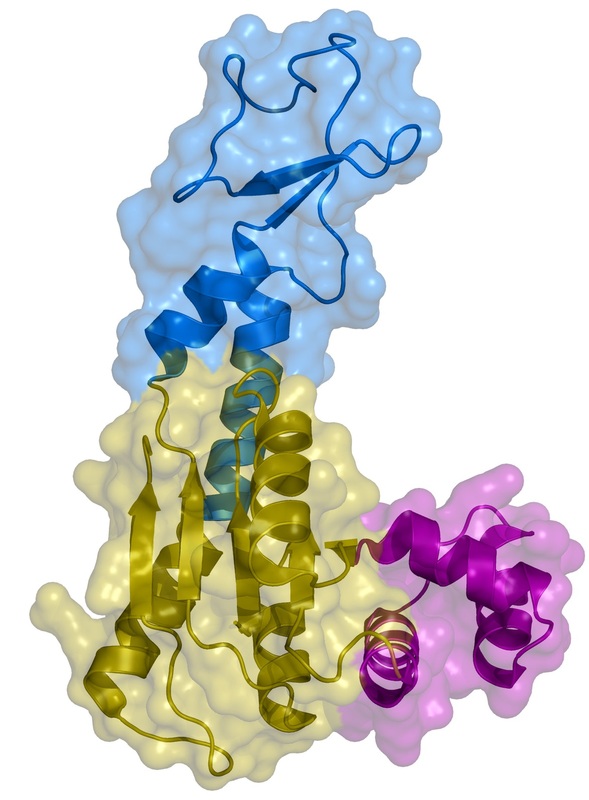 Instead, Buchko places the protein inside an NMR spectrometer and records information about the orientation, energy and other properties of all the atomic nuclei in the molecule. Then he interprets the information and feeds the thousands of pieces of data into a computer program to calculate the position of every atom, resulting in a complete 3-D reconstruction of the protein. Data analysis is crucial to getting the structures correct. Buchko has been an author on more than 20 of the team's studies in the last 10 years. Among his targets are pathogens that cause tuberculosis, malaria, cat scratch fever, and hemorrhagic fevers, as well as water-based parasites that cause severe diarrhea and abdominal pain. SSGCID scientists have published more than 100 manuscripts detailing their findings. In addition, all the structures are immediately shared with the scientific community through a public database called the Protein Data Bank. As a result, the structures have been used in nearly 600 scientific papers from other laboratories in academia, research institutes, and pharmaceutical companies around the world that are working on human pathogens. Sharing its findings so that scientists worldwide can make further discoveries is at the heart of SSGCID's mission. "When the SSGCID solves protein structures, it lays the foundation for researchers at CID Research and around the world to find new drugs, therapies and vaccine candidates for diseases that kill thousands each year," said Myler. "I'm very proud of the hard work carried out by our team and our dedicated partners." Full information about the structures the team has solved is available on the SSGCID web site.